What’s the Best Garage Door Opener? If your old garage door opener sounds like an airplane taking off, chances are it’s time to buy a new one. Today’s models of openers are capable of a lot more than their older counterparts, but which model is right for you? Here’s a closer look at some of the most common garage door openers so that you can decide which works best for your home. Chain drive motors use a chain and pulley system to lift your garage door. To this day, they are a popular choice for a variety of reasons, including their power and reliability. These openers tend to be noisier when compared with their counterparts and do require regular maintenance. That being said, if cost is a deciding factor, chain drive openers are generally the most inexpensive type of motors to install in your garage. Belt drive openers tend to be the most popular type of garage door openers, as they tend to be the quietest when opening and closing, making this ideal for garages that are near bedrooms and other living spaces. Belt drive openers that operate with direct current motors are even quieter as they offer soft starts and stops. All you’ll hear is a quiet hum! This type of opener isn’t ideal for wood, overlay or other types of heavy garage doors, and they are slightly more expensive than the chain drive openers. 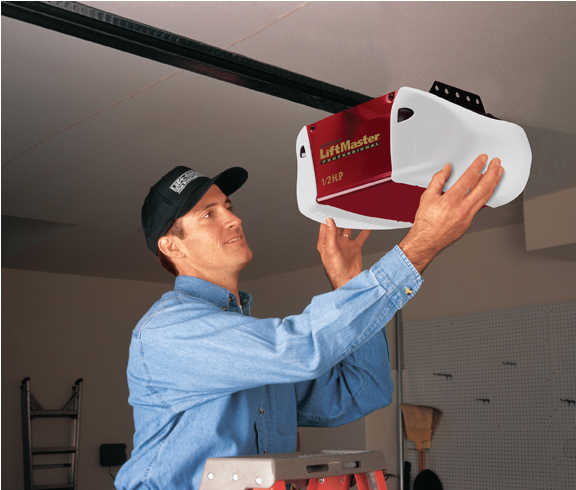 Jackshaft openers are mounted on the wall of your garage door versus on your ceiling. These motors are ideal for those with lower ceilings or for people who need storage above the garage door opening. Keep in mind, that this type of motor is the most expensive type of garage door opener. In addition, these motors require a torsion spring system to work. The work is attached directly to the torsion tub and spin it thereby raising the door. If you have an extension spring system we would be happy to convert you to the reliability of a torsion system. Can I use my Smartphone to Open and Close My Garage? A variety of garage door openers now come WiFi enabled, meaning that you can open and close your garage door with the MyQ app on your smartphone. And even if your opener doesn’t come with WiFi, you can install a Smart Hub to make any garage door opener from 1993 or later a smart garage door opener. Did the kids forget their keys? Not a problem – open your garage door while you are still at work! Leave the garage door open? Open up the myQ app and close the garage door, no matter your location! So, What’s the Best Garage Door Opener? From chain to belt to jackshaft openers, the process of choosing just the right motor can be confusing. Choosing the best opener for your home ultimately depends on your garage door, budget and preferences. If you have a heavier door, opt for a chain drive motor. Is your child’s bedroom directly above the garage? We strongly suggest a belt drive opener. Do you have really low ceilings in your garage? You’re going to need a jackshaft motor. Do you want to be able to open your door from your smartphone? Make sure it has WiFi. When it comes to installing a new opener, you want the dedicated team of certified experts from TGS Garages & Doors. One of our certified technicians can be at your home quickly with a fully stocked van to install your chosen opener same day. Contact us today for a consultation about which garage door opener is best suited to your home and lifestyle. We also invite you to browse current garage door coupons and rebates, designed to help you save!